At present, a variety of techniques designed for detecting earthquake forerunners using remote sensing data has been developed and are under test by a number of departments of JSC Russian Space Systems. In an effort to conduct an integrated experimental try-out of the developed techniques in order to establish a seismoprognostic monitoring system based on integration of data products generated in the JSC Russian Space Systems departments, at NTS OMZ there was created an experimental section of seismic forecast monitoring system prototype (Project ES SFM). To implement it, the Work Program was developed, and the test seismodangerous regions were selected in Kamchatka, Kuril Islands, Sakhalin, and Japan. The Work Program aims at practical try-out of using the pilot basic data products of ground-space seismoprognostic monitoring in order to solve special-purpose tasks of EMERCOM of Russian, Russian Academy of Sciences, and operators of remote sensing systems. In the future, Project ES SFM may be a functional SFM-subsystem being a part of the (IGMASS ( http://igmass.com/ )). Under the Work Program, in June there have been obtained the first positive results in ES SFM. Since April 1, 2012, the techniques that form the basis of developing the basic products of seismoprognostic monitoring (BP SFM) have been under testing in Russian Council of Experts on Earthquake Prediction, Seismic Hazard and Risk Assessment of RAS (RCE) and in Center «Antistikhiya» ( http://antistihia.ru/ ) of EMERCOM of Russia. The testing procedure involves the following: the BP SPMs developed using geophysical data obtained and EQ sign pending extraction techniques are appropriately delivered to RCE, Center „Antistikhiya“ and RAS Prognostic Center to analyze and expertise the correlation between the predicted date intervals, potential region, and magnitude range of probable seismic events and the real earthquake parameters. 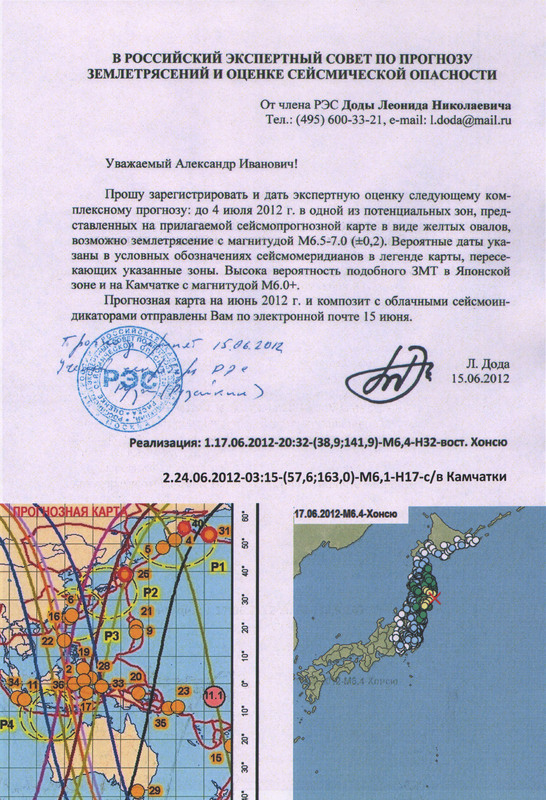 As an example of the BP SPNs successful use in seismic monitoring may be the June 17, 2012 M6.4 East Honshu EQ and June 24, 2012, M6.1 North-East Kamchatka EQ (Annex 1 ( http://www.ntsomz.ru/files/doda123.jpg )). As stated above, the mentioned regions are test sites designed to do works in ES SPM. They were selected deliberately: according to the long-term prediction by A.A. Lyubushin ( http://alexeylyubushin.narod.ru/Lyubushin_Japan_2011.03.11_Prediction_F-net_ENG.pdf ), S.A. Fedotov ( http://kcs.dvo.ru/ivs/bibl/sotrudn/fed/2009_2.pdf ) et al., these regions are anticipated to be affected by catastrophic earthquakes. Because of this, one of the Projects main tasks is to warn the mentioned catastrophic events. The strategy is rather simple: the probability of EQ occurrence with magnitude of greater than 6 is assessed using the techniques developed and geophysical data obtained for each 2-3 weeks in advance. More accurate magnitudes are determined by cloudy seismotectonic indicators (CSTI) detected in satellite images. Many examples of CSTIs of specific seismic events are given in the Center website in division «Pilot Project of Seismic Monitoring» ( http://eng.ntsomz.ru/projects/earthquake ). The BP SPMs relevant to the abovementioned earthquakes including CSTIs and other elements are given in Annex 2 ( http://www.ntsomz.ru/files/210612_2.pdf ).